As a writer, I’ve carried the tenet, “write what you know,” into my photography. As I’ve learned that medium, my subject has been sports — mainly, basketball and, more specifically, girl’s basketball. Having left that space, I’ve turned to more personal subject matter. One of those is birds and the outdoors. The backstory to the backstory behind these pictures is that I have had a long interest in photography. It’s in my blood, for sure. My mother’s family in Japan has operated camera stores for decades. One of my uncles won the Emperor’s Award for his photography. Though I focused on writing at a pretty early age, I always understood and appreciated the power of the image. (Note: Clicking on the images will open a larger version in a new browser window). I started taking photographs as editor-in-chief at Scout.com, primarily at the U.S. Army Bowl, which we sponsored. That role grew exponentially when I started my own website, HoopGurlz, now owned by ESPN.com. I focused on developing my photography because my subject matter was girl’s basketball and I believe women relate more visually than men. Plus, the sport was a niche subject, not previously covered on such a scale, and I felt I needed to put faces with names. My own movement into photography came as the erstwhile “news industry” began to embrace multimedia journalism. That meant for me, as with many others, adding photography, videography, audio collection and editing, in addition to mastering social media, to my tool box. My proudest culmination was having one of my pictures in an exhibit at the Smithsonian. At The Seattle Times, I worked for years beside some of the best photographers in the world. So it was only natural that I turned to news photographers for most of my training, gained at workshops across the country. 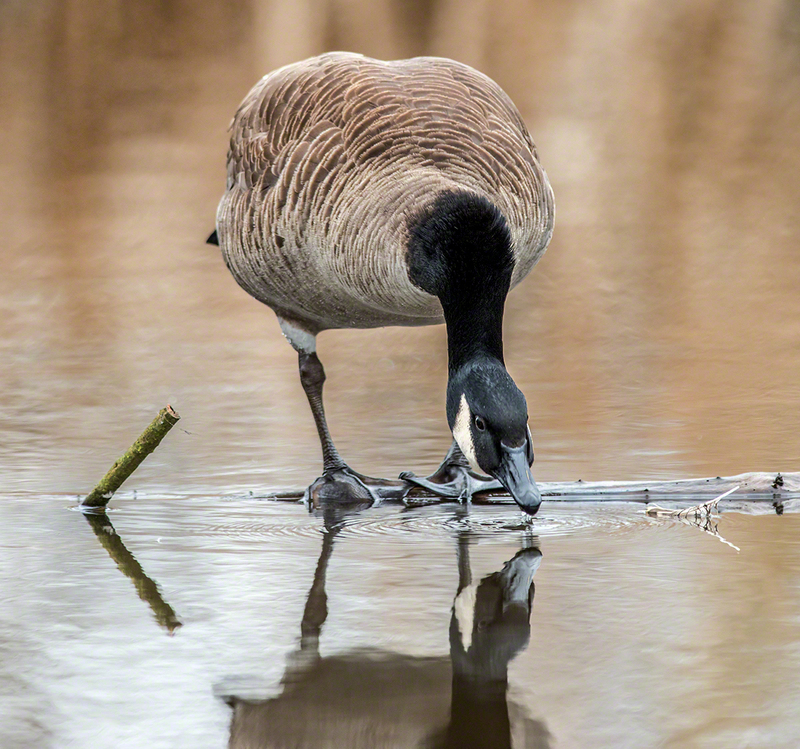 Canada Goose at Union Bay, Seattle. One of the best classes I’ve attended wasn’t very far away. A week ago, up in Padilla Bay near Mount Vernon, Wash., I attended a daylong session, set up by the Seattle Audubon Society, by the great wildlife photographer, Paul Bannick. I knew about Bannick because I’ve had his book, “The Owl and the Woodpecker,” and marveled this past fall, at the Burke Museum, at his astounding photo of a snowy owl in flight, which won a prestigious International Conservation Award. Usually, you hope to catch a few sprinkles of magic dust at these things, but Bannick generously gave up a treasure chest full of tips, more than you’d receive in a workshop several days long. Inspired — and I still had one day’s use of the Nikon 300mm F2.8 lens I rented — I went down to Union Bay, a common stomping ground, mainly for bird watching, in Seattle, near Husky Stadium. I felt far more competent and I didn’t get better photos because of the time of day and limitation of the equipment I brought with me. Canada geese may not be the sexiest topic, but the picture above was decent because I tried to expose so I could get the clear reflection in the water. Still inspired, I rented the lens again and journeyed down to Nisqually National Wildlife Refuge, which has become a favorite destination the past few months. The prize there, of course, was the Great Horned Owls and the newly fledged owlets. I saw one of the owlets and one of its parents and, after about six hours at Nisqually, felt so exhilarated that I drove up north (way north), to Padilla Bay, to a spot where Bannick said we could find Short-Eared Owls. I saw those, too, but with dusk descending, they were too far away to photograph. 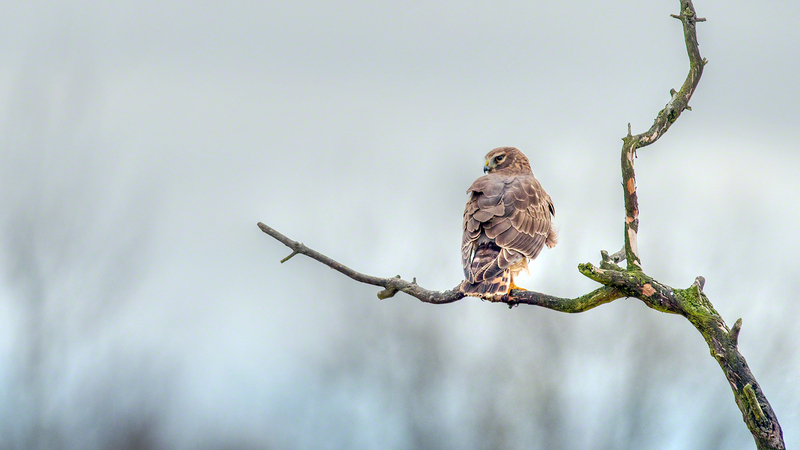 During a session in the field, Bannick had urged a few of us to try photograph a Northern Harrier perched on a branch. When we tried to get too close, it flew away. Bannick said it would return, but, alas, the class ended before it did. The Northern Harrier did return, however, when I did. And I was waiting for it, my shots prepared. 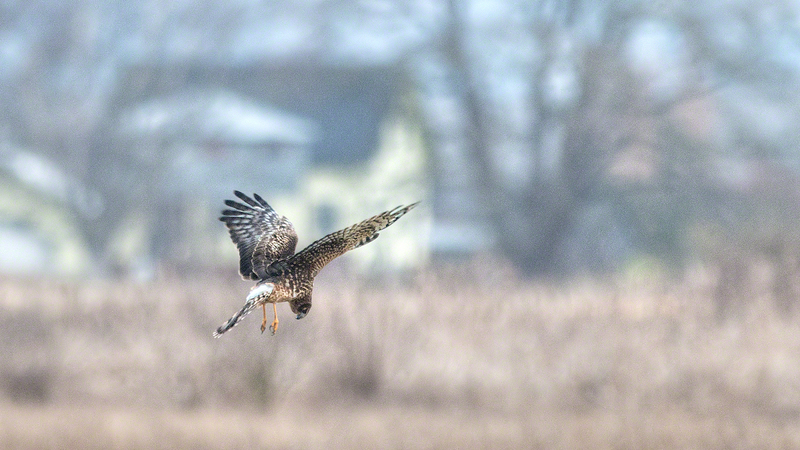 I wanted to capture the Northern Harrier doing something more interesting than just sitting there (I led this entire post with such a shot because of the clarity and colors). At Union Bay, I tried to photograph water fowl taking off, but always got the water crystal clear and the birds focused too softly. I hopefully learned my lesson. If I could set up the shot exactly the way I wanted, I would’ve planted myself in front, so I could capture the raptor’s face and eyes more clearly. Logistically, that was not possible. I’m not that disappointed because I captured the coloring and markings (eg., that glorious tail) from the topside. Usually, the photos you see are raptors in flight, so you get mostly the markings on their underside. For any techies who may be reading this, I shot these with a Nikon D800, Nikon 300mm F2.8 VRII and a Nikon TC-14E II 1.4x teleconverter atop a Gitzo Traveler tripod and a Markins Q3 Traveler ballhead, enhanced with a Wimberley Sidekick attachment for telephone lenses. It all sounds (and looks) impressive, but “advanced” photographers will recognize several weaknesses. First of all, I wasn’t using a rock-steady foundation. I have sturdier Gitzo sticks and have ordered a more substantial ballhead, but gambled with what I did to accommodate the Wimberley. The second, and maybe biggest, weakness is illustrated by the following picture. A teleconverter got me to 420mm reach with the lens; using DX (cropped) mode got me to 630mm focal range. All that extending sacrifices clarity. The Canada Goose, shot full sensor, is more clear and less noisy; if I’d shot straight 300mm, it would have been better yet. Overall, though it seems huge, even 630mm isn’t a huge amount of reach. Only the huge megapixel output (36.3) of the D800 allowed me to get a mediocre shot as below. 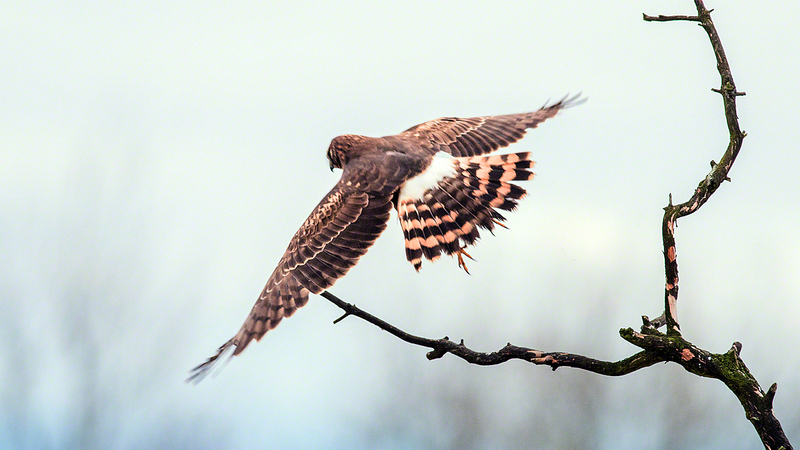 It’s a shot, by the way, that I like because, in addition to the impact of the early evening light on the background, it shows why the Northern Harrier, with its ability to hover and maneuver in tight spaced, is one of my favorite winged creatures. 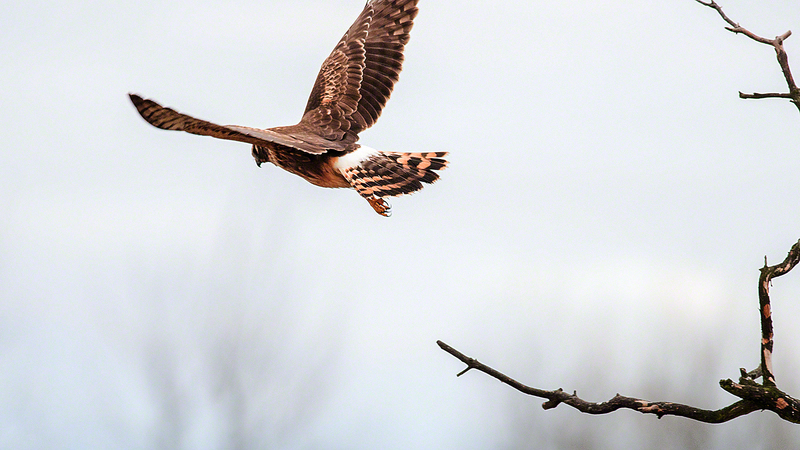 A Northern Harrier spots prey. My last note comes courtesy, not of any class I’ve taken, but from my years of experience as a journalist. You can research and plan to your heart’s content, have the exact right equipment, but life has a funny way of refusing to cooperate. So you have to be able to adjust. I went to the Nisqually NWR on a day that was forecast to be (relatively) sunny (which in February in the Pacific Northwest means “mitigated cloudiness”) and early enough to enjoy a low tide and take advantage of the usually sumptuous morning light. Turns out, it was dark and drizzly, the tide so low the birds were scattered, and the hunt for the Great Horned took too many hours. 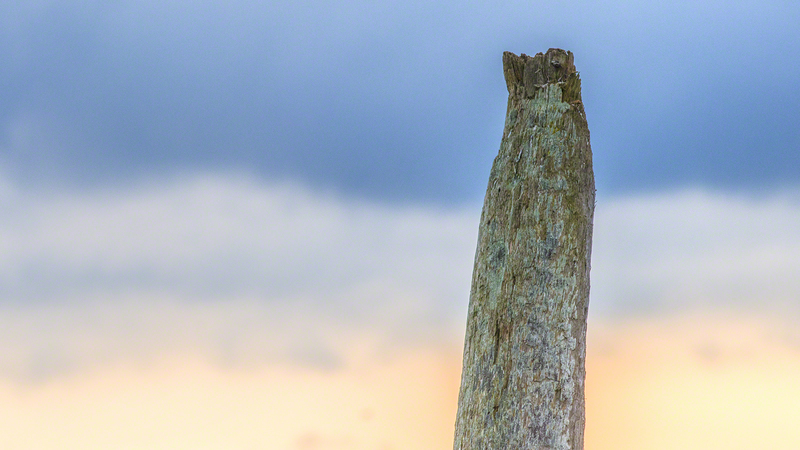 By the time I got up to Padilla Bay, I had maybe an hour of quasi-acceptable light. I spent some of that time on looking for Short-Eared Owls, some to set up the shot of the Northern Harrier and then I decided to spend the last bit hiking out to the dikes along the bay, to see what I could see. The following is what I saw, which would have looked far different viewed in another contest. You make of things what you can. The setting sun provides an interesting backdrop.